It is not too late to swing north and bring Austin some rain. We are really hot and would love to have some flowers bloom. You have no idea what it is like to wake up every morning to thousands of hungry babies. We can’t even hear ourselves think anymore with all the racket. Queen Knives has settled in nicely and is an egg laying machine. 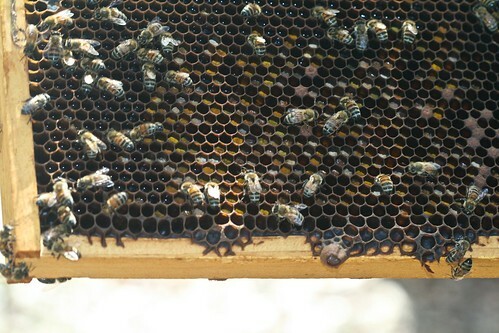 She had great capped brood patterns and several nice frames of cells with eggs. The second super had 6 frames completely drawn out with the 7th one almost done. I decided to add the third super to give them the space to build out as Knives definitely seems up to the task. With Queen Knives recent ascension to power, our whole evil-ex super concept got thrown off. We will still add the evil-ex supers as needed, but decided to pay respects to Ramona by creating a super that depicts the epic battle between Ramona and Knives from the comic. We like to think this is what went down in the hive as well. Thanks to the camera team for their drawing, inking, and lettering skills. 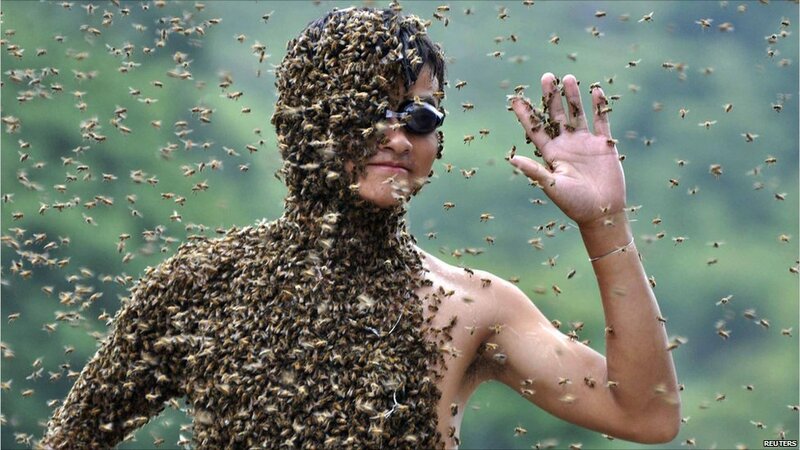 This contest pitted two Chinese beekeepers against each other to see who could attract the most bees. When life gives you 100 degree weather, melt wax. The one good thing about the hot and dry weather here in Austin is the ease of melting wax in my homemade solar wax melter. It doesn’t hold a lot of wax, but with every day being hot and sunny, I can process a lot of small batches. Here is the before shot. If you want to review how I made this contraption, check out this previous post. It has been a few weeks since I checked Marge’s hive. The top most super is still pretty much empty from the honey harvest a few weeks back. Without some rain and a good nectar flow, they won’t make much progress drawing out wax, but I’m leaving it on to prevent overcrowding. 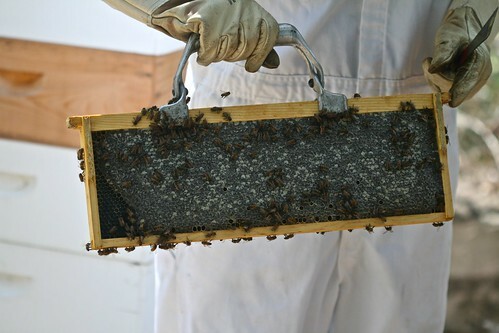 All eight frames on the 5th super are completely drawn out and filled with honey. The 4th super is filled with queen cells. 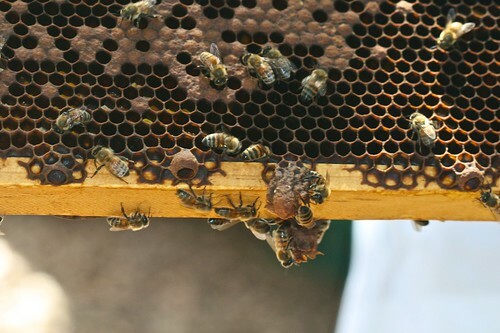 I’m pretty sure this hive may have swarmed once already, so I’m surprised to see more queen cells in the making. With the drought and heat right now, I can’t imagine any swarm would have good luck starting out and surviving. I also don’t get the sense that this hive is overflowing with bees either. Here is another frame with the start of a queen cell plus some really nice pollen. 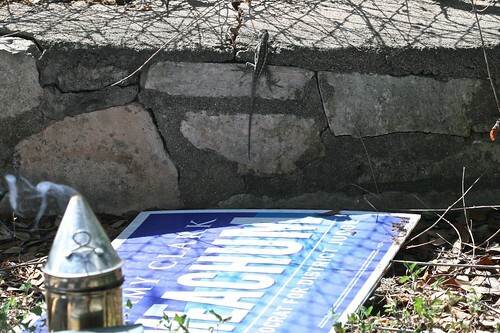 Our resident Texas Spiny Lizard also took advantage of the hive inspection to run in and eat some bees. Here he is scampering away after chowing down. 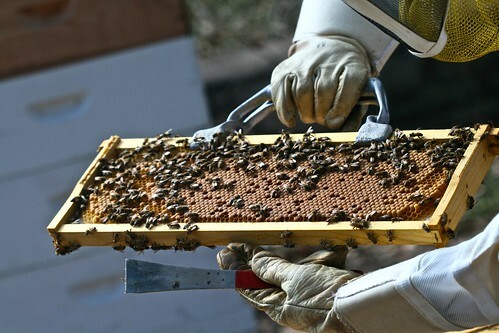 Most beekeepers (especially urban beekeepers) usually worry about the pests that live inside the hive like small hive beetles and varroa mites. We now have documented evidence that a skunk has taken up residence in the beeyard. Skunks can be a major problem for beekeepers as they like to eat bees and their thick fur protects them from stings. A single skunk can really damage a colony in just a single evening. So far I haven’t seen any signs that this particular skunk has been bothering the hives, but I am going to take some precautionary measures. Elevated hive stands help as it forces the skunk to expose its underbelly to reach the hive entrance. My hives are on stands, but they are not that far off the ground so I’m not sure how much good it will do. 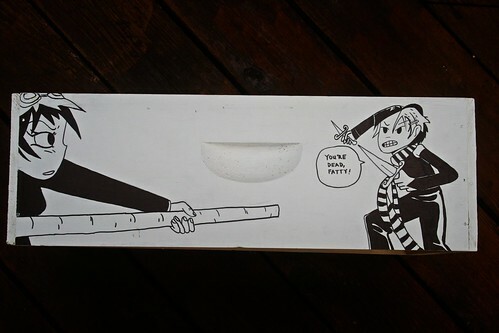 I think I’m going to try a product they sell to deter cats from areas in your yard. Hopefully these spiky mats will prevent the skunk from investigating the hives and deciding they are a great all you can eat buffet.